for those of us that love to flash roms on our android phones there is a new one that has the potential to be awesome – its Firefox OS. At this point, you cannot download it but when it becomes available I will be trying it out. I think if mozilla wants to have a chance they need to make phones with firefox os that are unlocked, inexpensive without contracts, and will work on all major carriers. *Note that pacman is not discussed in any of these. It is simply a combination of cmod, aokp, and paranoid. It is awesome but I was only using the aokp features it offered so I figured I would just switch back to the stock aokp. Why root your android phone? There are a million reasons why you should and should not root your android phone. I am going to go through some of the more popular reasons now. In a later post I will go through how to root your phone and what to do once you are rooted. 2. Get the latest updates – when you root you can get the latest version of android within days of it being released. If you are not rooted you might actually never get the update. Only a very small % of phones are updated to the latest version of android out there. Do you know why your phone is not updated? It would require samsung/lg/etc to work on the operating system and test it on your phone. Why do they care to that if you phone is already 6 months old and they are focused on the newer ones that replaced it already? 4. Use cyanogenmod or AOKP or Baked Beans (among many others) – what does this even mean? These are groups that have taken the android operating system and improved it. If you are rooted you can install their version on your phone. They offer tons of great options and themes. For example putting the battery % on the notification bar, weather, or date. Basically allowing you to do whatever you would like. 5. A very advanced feature – access to the phones internal controls. If you do not know what that means just ignore this as a feature until you are ready to test it out. 1. Voids warranty. If you are unsure you might want to wait until your warranty runs out. However remember you can unroot. 2. Brick – if you brick your phone (ie break it) you are out of luck. However its not very easy to do. 3. Nexus – if you have a nexus you might not really need to root. You have stock android to begin with and should get your updates fairly fast. 4. Rooted apps coming to non rooted devices – in some cases this is happening so some of the great features rooted users have always enjoyed are now on regular devices such as a wifi hot spot. 1. Open up terminal (unix/dos dialog box). On the Mac this is under applications->utilities->terminal on the PC its under Start->Programs->Accessories. It will simply be a command prompt for you to type. a. You need to change my-release-key.keystore to your own file name. So it could by like: raypastore.keystore if I wanted. This will be your file name. b. alias_name should be changed to another name as well. PLEASE REMEMBER THIS. You will more than likely need this to use your .keystore file. 3. Press enter. You will be prompted with a few questions asking your name and such. Please remember your password. 4. Use the file. You will need your alias name and password. If you have trouble finding the created file just do a file search for .keystore and it will come up. Check out Google new Android Device Manager. You can use it to locate your phone, lock it, erase it, and make it ring. This is an awesome service for those of you with droid that used to use apps to do this. “How does 64-bit help Apple? Here’s how going 64-bit makes sense for the iPhone 5S, and for Apple’s mobile devices going forward. Memory: Mobile devices aren’t facing the 4GB barrier yet. (Game consoles weren’t either: the Playstation 4 and Xbox One will be the first to ship with more than 4GB of memory.) The Samsung Galaxy Note 3 currently has the most RAM in a mobile device, packing in 3GB pretty much just so Samsung can show off. In comparison, the iPhone 5 – along with the new iPhone 5C and iPhone 5S – sport only 1GB of RAM. The iPhone 4 and 4s have 512MB. One reason for that is that RAM has to be on all the time, consuming precious battery power. 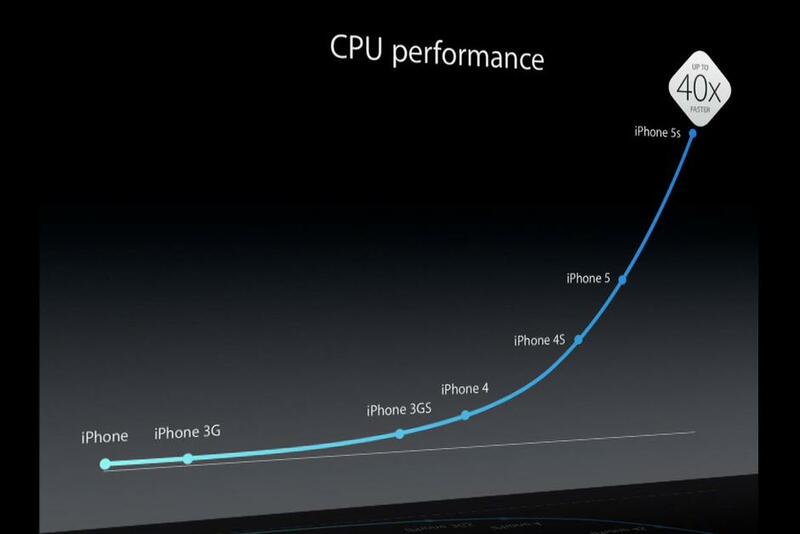 Right now, Apple does not need a 64-bit chip to handle memory. However, the iPhone and iPad may reach or surpass the 4GB threshold in the next two or three years. If so, developers will have been building 64-bit iOS software for years by the time iPads, iPhones, and any other iDevices have require a 64-bit architecture. That’s a good way to ensure a seamless transition for customers. The iPhone 5S 64-bit mode outperformed 32-bit mode by up to 25 percent. That means most apps will get a free performance boost just for recompiling to 64-bit. 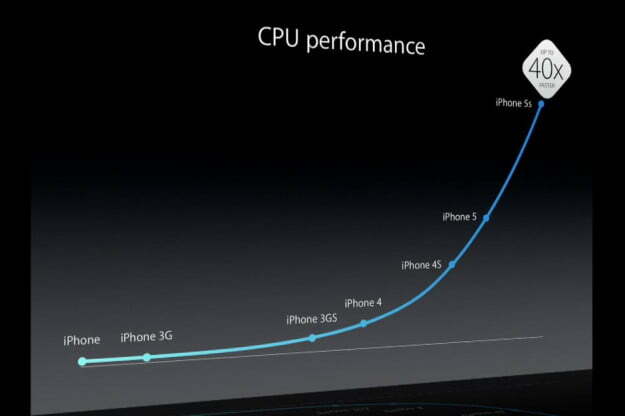 The iPhone 5S processor is about twice as fast as the iPhone 5 in everything but memory access (that’s 1.4x faster). The 64-bit A7 isn’t just a marketing stunt. It delivers real performance benefits for apps right now. Apple builds further on those benefits by converting all of iOS 7 to 64-bit for the iPhone 5S – and for any future 64-bit devices (cough iPad 5 cough) that come along. That means iOS 7 – along with core apps like Safari, Mail, Photos, Maps, and Siri – all wring the most benefits from 64-bit performance, and some of those components improve performance for third-party apps as well.